Height 5 feet 8½ inches. Weight 140 lbs. Chest measurement 33-36 inches. Vaccinated. Small hairy mole lower part right cheek. George William Andrew Cooling was the older son of George Henry and Mary (née Aitken) Cooling. 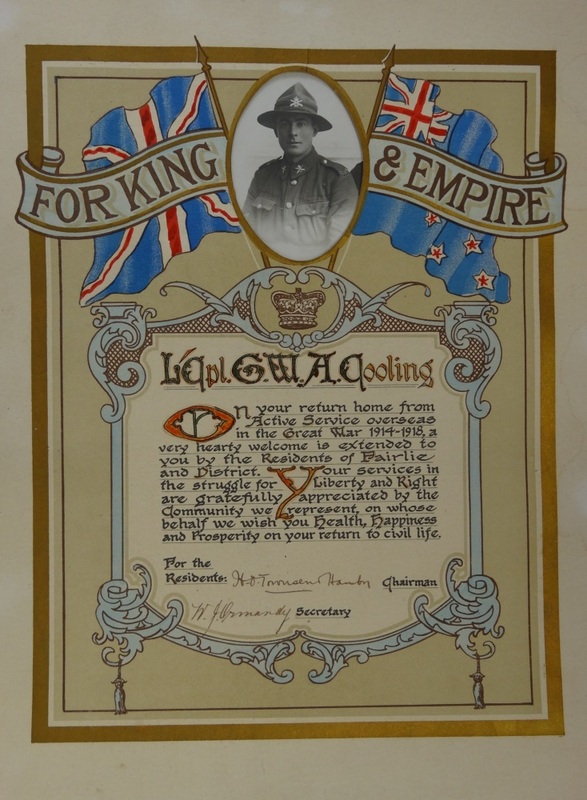 George was initially posted to the 1st Canterbury Company on arrival at Sling Camp, England in July 1916, but transferred to No.1 Machine Gun Company. He recieved a gun shot wound in action on 21 Juanuary 1917, resulting in a transfer back to England for three months convalescence. He returned to service as an instructor at the Machine Gun Depot, holding ther rank of Temporary Staff Sergeant, before returning to France in March 1918, where he relinquished his appointment and spent a short period with the 3rd Entrenching Battalion before returning to serve with the Machine Gun Corps until the end of thew war.